This 450 page illustrated handbook is a ready reference tool on the restoration and rehabilitation of historic interiors. The Handbook is divided into eight sections: Planning; Architectural Features and Materials; Finishes and Accessories; Systems and Fixtures; Fire Protection and Codes; Adaptive Reuse; Manufacturers, Sources and Literature; Annotated Bibliograpy. The Handbook is designed to be used, expanded, updated, and personalized by its owner in response to a growing and changing field. Published in 1993 by HPEF and the National Park Service. 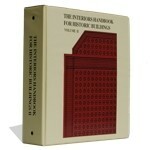 The first volume contains over 500 pages of practical information on restoring and rehabilitating historic interiors with sections on inspection and planning; architectural features and materials; systems and fixtures; adaptive reuse; finishes and decorative accessories; and fire protection and codes. Useful information and guidance is provided for architects, interior designers, curators, conservators, property owners, and building managers. Includes a company directory and annotated bibliography. Published in 1988 by HPEF.